If 72-metre long National Flag rally on the streets of Silchar was not enough to wake up the bustling residents of this town, the evening shadows mesmerized even further as thousands thronged the bank of river Barak to witness the traditional boat race that started way back in 1947, and held each year, on this day. Today too was no different, as people from all walks of life, young and the old, sat alongside the bank of the river Barak and witnessed a splendid display of boat race among villagers and peasants taking part in this event. The event was organized by Cachar Sporting Club, which was established in 1936. With ex-Union Minister Late Santosh Mohon Dev being a key patron, this club has been able to hold this event without any mishap since 1947. No wonder, MP from Silchar and All India Mahila Congress President, Miss Sushmita Dev, was one among thousand of spectators present today to witness this extravaganza. SDRF teams were kept in places since afternoon to monitor every movement of boats and human beings plying on this river, and likewise, help for any casualties if at all any, takes place. He added, “Three segments are there to compete in this boat race. Small boats, mid-size boats, and big boats are placed to take part in this competition. The winners of big boat categorygets a prize and a trophy of Rs 50,000, the mid sized boat winner gets Rs 30,000 while the small ones get Rs 10,000. This year too the top prize of Rs 50,000 and a running trophy is being donated by Late Santosh Mohon Dev and would be handed over to the winners by MP Sushmita Dev”. 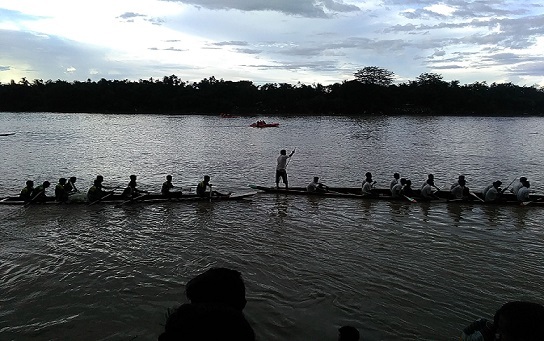 Participants who took part in this boat race were later given prizes in presence of MP Silchar and special invitee MLA from Hailakandi, Anwar Hussain, as light drizzle culminated a wonderful day of festivities witnessed by every denizens of Silchar on its 72nd Independence Day.